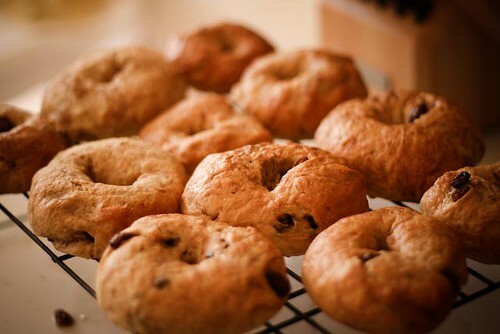 My Dad is in town this weekend, and when I was trying to think of something to bake for him, I remembered how much he loves cinnamon raisin bagels each and every morning and I found a recipe for them on the Passionate Homemaking website. I should've taken pictures during the process, but I wasn't sure they would turn out. They did, in fact, turn out. And I can now highly recommend this recipe. It is so much easier than I thought bagel making would be! The bagels are delicious and have all the bagel flavor and texture you'd imagine. 1. In a small bowl, mix yeast, 1 tablespoon honey and warm water together and let stand 3 minutes. 3. Knead dough on a lightly floured surface for 5 minutes (or use stand mixer instead). Dough should be fairly smooth and somewhat firm. Place the dough in a greased bowl, cover and let rise until doubled. 4. After about an hour (or until doubled), punch down dough. If you're making cinnamon raisin bagels, add the cinnamon and raisins now - kneed just enough to swirl the cinnamon through the dough. Divide and shape into 12 balls. Allow to rest for 5 minutes. 5. Make a hole in each ball of dough and pull open about 2 inches, making a bagel shape. Place the shaped dough onto a cookie sheet and cover for 10 minutes. 6. Bring 2 quarts of water to boil. Preheat oven to 350 degrees. Drop 2 or 3 bagels at a time into the boiling water for about 45 seconds, turning each once. 7. Drain cooked bagels on a wire rack. Mix egg white and water; brush tops with egg white mixture and top with optional toppings, if using. Place bagels on greased baking sheets. 8. Bake at 350° F for 35 minutes, rotating once half-way through baking. Bagels will be lightly browned and shiny. There you go! 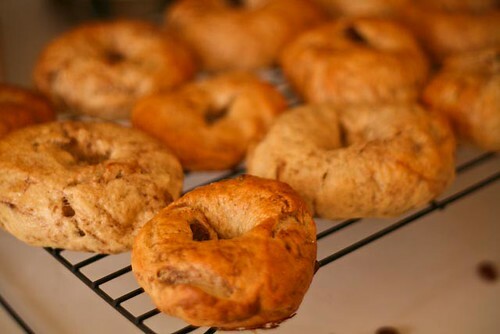 Fresh, homemade bagels that everyone in your house will love you for (the smell alone is amazing). Speaking of the Passionate Homemaking website, I highly recommend it for just about everything when it comes to natural living. Lindsay from Passionate Homemaking has an abundance of ideas for natural cleaning recipes that have all worked really well so far. It can be a little overwhelming at first, but hopefully fun, too (and it really will save you money). I even tried her homemade deodorant recipe yesterday and had great success! After hearing how store-bought deodorants that contain aluminum (which is about 99% of them) have been linked to breast cancer, it just doesn't seem worth the risk. But at the same time, store-bought all-natural deodorants are pretty expensive and don't always work. So why not make your own, right? I am stunned by how well this works. Definitely keeps you smelling fresh, goes on clear, and even smells a little exotic (like coconut!) but not strong at all. 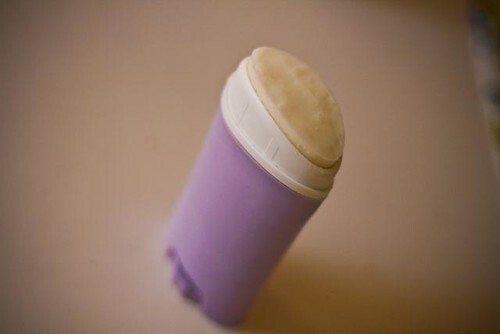 I put it into my old container with a knife and it works just like my old deodorant did, just a lot safer! If you try these, please let me know if they worked as well for you! 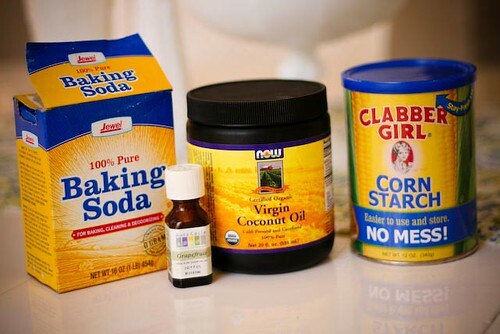 *Coconut oil can be found at Whole Foods or other health food stores (or online) and is somewhat expensive, but so very useful in many, many things. Not only has it been proven extremely beneficial to your health when eaten alone, but it can be used by itself as moisturizer, in baking or sauteeing, in combination with other ingredients as toothpaste (my next adventure), or as aftershave or conditioner. You'll definitely get your money's worth! I thought of you when I came across this article. I know you like to make stuff homemade, and body wash isn't something I've seen from you yet! Lots of body washes leave invisible films on our skin and don't allow them to breathe, so I wonder if making them at home would prevent the extra unnecessary ingredients? those bagels look so good! i must give it a shot! So I am not quite Martha Stewart - in fact, I struggle with baking from a box but I really have enjoyed reading all of your cooking and natural living recipes. They have absolutely inspired me!!! This weekend I made homemade laundry detergent. It is wonderful!! Not only was I excited about doing laundry, but most importantly it works great! I had a disgustingly dirty and molding bath mat to wash and it came out sparkling white - good as new! So impressive! Cousin - Thanks so much for that website!! I will totally look into it! Rubyellen - I LOVE your blog and your sweet family is so refreshing! I made some of this the other day and I love it! I feel so much better about putting this on my body than the regular aluminum-filled deodorants. I don't think that God intended for us to load our bodies with all the chemicals that we do, and I'm trying my best to eliminate the unnecessary ones. I also am using the "no-poo" method and I'm a fan for sure! Hey Whitney! Just wondering if you've ever tried making these since going gluten-free? Would these work with a gluten-free flour blend? Just curious! I haven't tried but it would have to be a really good recipe for it to work... gluten-free flour with yeast is super tricky!